And how prayer and property rights saved the day. We’ve all heard some version of the story of Thanksgiving, whether as a story of pilgrim gratitude toward helpful Indians or gratitude for God’s providential care. But there’s more to the story: communism. If you’ve forgotten your history lessons, here is a quick review: the first year after the Mayflower landed was a hard one. Only half of the Puritans who had originally set out from England survived, and when the ship arrived at Plymouth, many of the pilgrims fell ill and died. Those who survived found that their Old World farming methods did not work as well in the New World as they had hoped. They could not grow enough food to survive. But when all seemed lost, an English-speaking Indian named Squanto arrived and taught them to fertilize their corn with fish, and taught them other life saving techniques such as stream-fishing, growing pumpkins and hunting beaver. Squanto, likely a baptized Catholic, also helped the pilgrims to secure a peace treaty with nearby Indians. Grateful to God for their deliverance from death, the Puritan leader William Bradford declared a day of thanksgiving, and invited Squanto’s adopted tribe the Wampanoags to celebrate with them. It was a huge success. The Wampanoags enjoyed the celebration so much, they stayed for three days. Now here’s the part of the story you may not know. Unfortunately, the pilgrims’ troubles were not over. 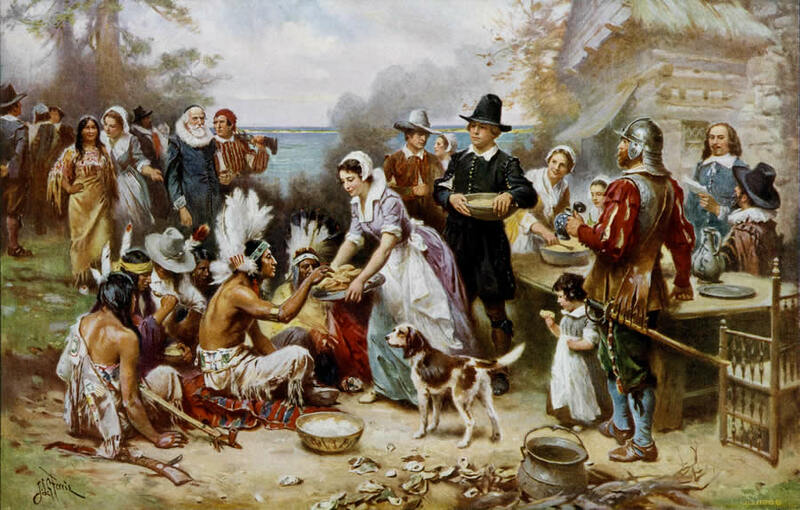 Although Squanto’s farming techniques worked better than their old ones, the pilgrims still could not produce enough food. Was it bad luck? Bad soil? No. The Mayflower pilgrims were part of a joint stock company which stipulated that the pilgrims would pool their resources, and receive a share of the profit. The strategy turned out to be deeply misguided, working about as well as various communist economic schemes hundreds of years later. The sad state of the colony after two years of communism, wrote William Bradford, “may well evidence the vanity of that conceit of Plato’s and the other ancients applauded by some of later times; that the taking away of property and the bringing of community into a commonwealth would make them happy and flourishing; as if they were wiser than God” (p. 121). This had good success, for it made all hands very industrious, so that more corn was planted than could have been by any other means the Governor could use, and saved him a great deal of trouble, and gave far better content. The women now went willingly into the field, and took their little ones with them to set corn; which before would allege weakness and inability; whom to have compelled would have been thought great tyranny and oppression. In fact, it’s estimated the colonists planted about six times the crops they would have planted otherwise. With new farming techniques and an amended government, the pilgrims did all they humanly could to ward off starvation. But they could not control the weather. A drought settled on the colony and threatened to kill the corn before the harvest. Recognizing with the Psalmist that “except the Lord build the house, they labor in vain that build it,” the colonists turned to God. According to Bradford, they “set apart a solemn day of humiliation to seek the Lord by humble & fervent prayer, in this great distress.” What was the outcome? Then William Bradford again proclaimed a day of Thanksgiving to God, the forerunner of the American tradition of Thanksgiving. I found it interesting you posted this article without any quotes from CS Lewis……What did CS Lewis have to say about communism?